The H16 turret model is the all time classic! 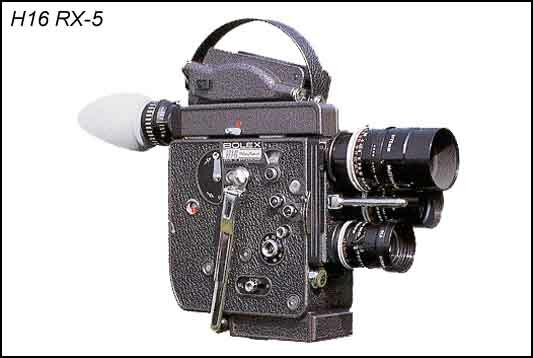 More of this Bolex has been sold than any other model. Almost every filmmaker at some time has used one. The majority of teaching facilities use this tough workhorse. I'm sure that Jacques Bogopolsky (later simplified to Jacques Boolsky) a Russian born engineer who emigrated to Geneva could have never guessed that his Bolex cameras would today carry a Serial Number over 350,000. The Swiss factory Paillard perfected the rugged clock mechanism that has been changed very little since the early 30's. Claw refinement in 1954 and reflex viewfinder in 1956 made this truly a camera capable of professional work. The independent made film, "Endless Summer," shot on Bolexes during this time became the largest grossing Independent film ever, and is still grossing revenue today. Refinements and innovations have brought us to the fourth generation H16 RX-5 today. The choice of many serious filmmakers for almost any application. You should consider this model for your current filming needs. Powerful spring motor with high precision governor (drives 5 m 16.4 ft of film with a single winding). • The camera can be fitted with an auxiliary electric motor. • Shutter with variable opening angle (with the camera stopped as well as while filming); maximum opening 135°; shutter closes when camera stops. Operation: normal forward motion, continuous and single-frame filming, full rewinding with hand crank. • Automatic threading; spool ejection; loop former. Filming speeds 12, 16, 18, 24, 32, 48 & 64 fps + single frame. Reflex viewfinder with light captured through exceptionally sturdy, swiveling, maladjustment proof prism, mounted in front of the shutter. • No flicker; picture always visible. • Fine ground glass on prism itself. • Magnification 13 X. • Adjustable eyepiece: ± 5 diopters. Rubber eyecup, directional and can be folded over. • Viewfinder light trap. • Field of view corresponding to standard 16mm projection field. • TV frame: 8.40 x 6.30 mm; R = 1.7 mm. Also offered in Super 16 mm format. Lens turret for three "C" mount lenses. • Thread diameter: 1" (25.4 mm). • Focal flange distance: 17.52 mm .690". • Built-in filter slot for gelatin filters. The H16 RX-5 spring camera can be equipped with the Vario-Switar 100 PTL or 100 POE-4 lenses with built-in light meter, which automatically sets the diaphragm during filming. We also offer an optional built-in light meter. Camera equipped with ESM auxiliary motor: possibility of synchronization by crystal control or sync pulse equipment with automatic clapper, at 24 or 25 fps. Other motors available and crystal speeds available. Capacity: all single or double perforated 16 mm films on 100 ft spools; possibility of fitting 400 ft magazine. • Frame counter. • Counter in feet or in meters. • Front release for normal operation; side release for normal, continuous and single-frame operation (can be operated by cable release). We currently offer this camera (Newly manufactured from the factory) to film in Super 16 only (not both).